This article is part of a 3 part series talking about how to learn songwriting. To go to part one, click here now. And part two can be found here. Also, if you would like to take the most effective course available and shortcut your way to songwriting success, click here and discover The Songwriting Genius Within You. Step 8 is to create a vocal melody to go over the top of the instrumental you created earlier. This is a really fun step because you see your song really begin to form something special. A simple technique you can use is simply play through the recording of your song, and then hum ideas that come to you. Ideally you need to be able to record this… so I recommend you get some multi-track software (such as the free version of Audacity ). This way you can allow your instrumental to play through and RECORD your vocal ideas to a second track. After your break, come back to the three recordings and listen to them one by one. You’ll be sure to find some very usable vocal melodies in these three takes… maybe even something REALLY good! (Remember, the point of this formula is to learn songwriting and get one song into a complete form. You will create much better ideas in the future. For now though, realize that you're trying to put something together really quickly, and be satisfied with the best ideas that came from your three takes. You can always improve these melodies AFTER you've completed this procedure. The next step is to fit your lyrics and melody together so they interlock nicely. Once you’ve worked out how to fit your melody and lyrics together, it’s time to record the vocal line over the instrumental you previously created. Again, a cheap way to do this is to use the free program Audacity, where all you need is a computer and cheap microphone to record multiple tracks. Bring the recording of the instrumental into an Audacity session, and then as it plays through, record yourself singing your melody line over the top. After two to three takes you should have something pretty good! You’ve probably noticed that the process I’ve just outlined is very reliant on monitoring FEEDBACK and using it to create your song. For example… when you created the instrumental, you created for 40 minutes and then you monitored the results of this session. In other words you created a feedback loop so you could learn and take ideas from your session. Same with the lyrics. And the vocal melody. This is a crucial concept if you want to learn songwriting and continually improve. So with this in mind, can you think of a way you can improve from the song you’ve just written? Well, in this case the SONG ITSELF is the feedback. To learn from this feedback, here’s what you can do. After a day of letting the song sit, pull out the recording and a piece of paper. Next, write down 5 things you LOVE about the song. What this has done is made you aware of the things that made your song bad, and also the things that made your song great. The next time you write, this information will be priceless, because you’ll be able to avoid the things you hated and gravitate towards what you LOVED. This is the formula to continually improving as an artist. Always keep in mind this simple formula… it's the fastest way to learn songwriting and get good in no time. CREATE in a non-judgmental manner, following your intuition. And then LISTEN back to what you’ve created, notice what you like about it and notice what you don’t. Over time, the things that you don’t like will drop away completely and the things you LOVE will improve exponentially, causing you to improve at mock speed. 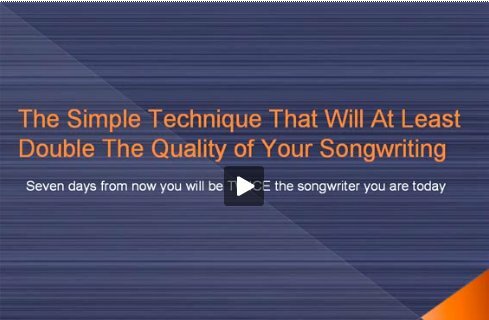 Be sure to complete the formula outline on this page, and if you want to learn songwriting by using the largest collection of songwriting secrets ever assembled which will enable you to tap into your “inner genius” click here to learn songwriting and discover The Songwriting Genius Within You.